University Notes: The Big Purple Marching Band is a dynamic and exciting ensemble comprised of both music and non-music majors. The Big Purple is one of the largest co-ed organizations on the ACU campus. The band is a vital part of the ACU Opening Assembly each year, performs at all home football games and, often, away games. 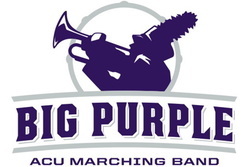 The Big Purple also presents exhibition performances at invitational and UIL marching contests. Scholarships are available for ALL participants and no audition is required for enrollment. Most students are eligible to receive one P.E. credit for their participation. The camaraderie among Big Purple Band members is legendary on campus, offering great social opportunities and friendships that last a lifetime, as well as the pride of performing in one of ACU's best-loved music traditions. Mascot: Crimson Tide, "Big Al" the elephant. University Notes: The football team has won 15 national championships. The chant used to show your support is "Roll Tide!!" Performing in front of millions of fans each year, the Million Dollar Band has been a Crimson Tide tradition for almost 100 years. Saturdays at the Capstone wouldn't be the same without the excitement provided by the 400 members of the Million Dollar Band, which is one of the most respected university marching bands in the country. 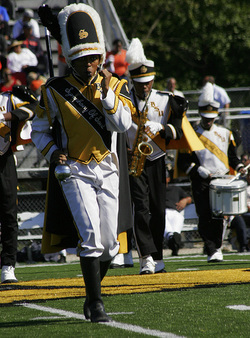 Members of the Million Dollar Band are majors in almost every school and department within the University and the Million Dollar Band is easily the largest student organization on campus. In addition to winning the Sudler Award in 2003, which designates the “National Champion” of collegiate marching bands, the Million Dollar Band has been invited to perform exhibitions all over the country. The band traveled to Atlanta in October of 2007 to perform exhibition at the Bands of America Regional Championships. University Notes: For the past 15 years, the Marching Blazers have thrilled thousands of fans with exciting performances that have helped make the Blazers one of the great college bands of the South. 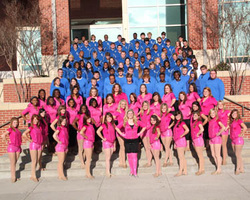 As the school’s athletic music ambassadors, the Sound of the Magic City is the university’s largest performing ensemble. The pride and tradition of excellence continues into the 21st century as the Marching Blazers press forward on our journey to present the highest level of musical and visual performance at Legion Field in Birmingham, and around the Country! University Notes: The UAM “Pride of Southeast Arkansas” Marching Band is open to all University students who play band instruments and to those who have experience on auxiliary lines (color guard/flag, twirlers, etc.). 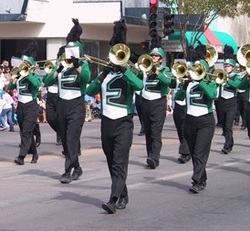 The Marching Band employs a variety of musical styles, marches corps style, and performs at all UAM home football games, as well as area parades, fairs, and festivals. Generous scholarships are available for students possessing exceptional talent. 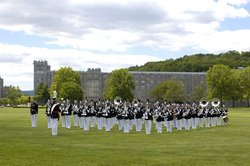 University Notes: Comprised of graduates from America's finest music schools, the professional musicians of the West Point Band are honored to present provocative performances while providing the U.S. Military Academy's Corps of Cadets with a piece of living history. Today's West Point Band is comprised of four components: the Concert Band, the Jazz Knights, the Hellcats, and Support Staff. University Notes: The Eagle Marching Band is made up of 85 students and includes flags, rifles and a feature twirler. The group performs for all home games as well as traveling to marching exhibitions throughout Ohio. One of the most active organizations on campus, the band has come to represent the best in musical presentation and exciting movement within a contemporary style. University Notes: Football team was in the 2014 BCS Championship. The chant used to show your support is "War Eagle!". For over a century, the Auburn University Marching Band has captivated audiences across the nation with spectacular performances. Whether marching before the home crowd or away, the Auburn Band has attained a position of national distinction and a reputation for excellence second to none. The Auburn University Marching Band has built an international reputation for its precise, entertaining, and colorful performances on the field, unyielding and spirited support for its sports teams, and prideful ambassadorship for Auburn University. The marching band was named the 2004 recipient of the Sudler Intercollegiate Marching Band Trophy, the nation’s highest and most coveted award for college and university marching bands. With 380 members, the current marching band is the largest in university history. The band recently performed at the 2011 BCS National Championship Game and the 2011 Southeastern Conference Championship Game. Other recent appearances include the 2010 Outback Bowl, the 2007 Chick-fil-a Bowl, and the 2008 St. Patrick’s Day Parade in Dublin, Ireland. 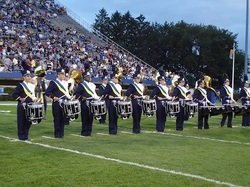 The band was one of only six collegiate marching bands selected by ESPN to participate in its 2008 Battle of the Bands promotion. University Notes: Comprised of over 300 members, The Golden Wave is the largest student musical organization at Baylor University and stands as an icon of campus tradition. Our membership includes students from across the nation and represent all academic disciplines of Baylor, including Music, Science, Business, Pre-Med, and Engineering. The remarkable spirit of the Golden Wave Band comes from the enthusiasm of hundreds of such students who combine their collaborative talents and backgrounds to create a high quality musical experience. The Golden Wave performs both on and off the Baylor campus and travels to other university campuses during the football season. The band also makes frequent featured appearances at various regional and state-level marching contests including the Texas UIL State Marching Contest. The band performs innovative music and drill that represents both traditional and contemporary marching styles. For over 100 years the Baylor University Golden Wave Band has stirred the hearts of Baylor fans with its powerful music and creative marching drills. The band is as much a part of Baylor tradition as the Green and Gold. Both on the field and in the stands, the members of the band create an atmosphere of excitement through outstanding musical performance and an unabashed spirit for Baylor football. University Notes: The Belhaven "Blazer" Marching Band is an exciting and dynamic ensemble comprised of both music and non-music majors. Made up from almost every field of study, it is one of the larger co-ed organizations on the campus. Approximately 85% of the members are not music majors. The band is a vital part of the Belhaven University Athletics; performing at all home football games, some away games, parades, and marching exhibitions. Scholarships are available for all participants that audition and are accepted into the band. Experience great camaraderie among Blazer Band members, experiencing great social opportunities and friendships that last a lifetime, as well as the pride of performing in one of Belhaven University's best-loved new music traditions. 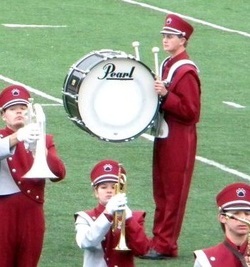 Band members consistently gain recognition on campus, and are active in many campus organizations. The Benedict College "Band of Distinction"
Marching Band Website: The Benedict College "Band of Distinction"
Director of Marching Band: Herman Jones Jr.
University Notes: ​The BOD Marching Band is made up of both music and non-music majors consisting of a number of selected musicians and auxiliary. Membership is open to all students at Benedict College. Members are selected through an audition process and the Fall Pre-School Band Camp, which is held before the beginning of the fall semester. Any enrolled student who becomes interested in performing in the band may try out during the Annual Spring Band Camp. 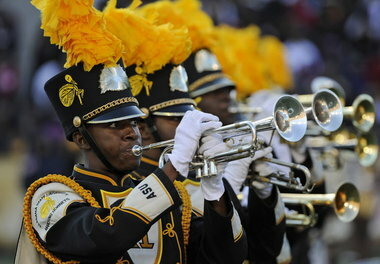 The Benedict College Band Of Distinction (BOD) performs at all home football games, selected away games, parades, band competitions, exhibitions and any other functions deemed necessary by the President or Director of Bands. University Notes: The Boise State University Keith Stein Blue Thunder Marching Band, under the direction of Dr. Joe Tornello, is one of the most prominent aspects of campus and community life. It serves as an ambassador for the University and its athletic programs, and is one of the most rewarding activities any student can pursue. Blue Thunder’s high-energy, entertaining halftime shows and quality sound make this band the "Pride of Idaho". University Notes:The BU Marching Band has come a long way from the 30 piece all male ROTC band that was created in 1920. 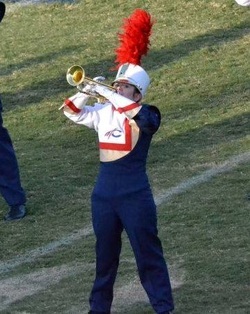 The current Band is a corps style band with a large wind block, drum line, front ensemble (pit), and color guard. 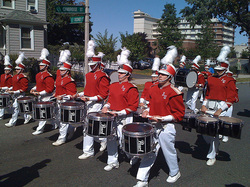 The Band performs numerous exhibition field shows all over New England, including several local and regional parades. Not being locked into a football schedule, the Band has much more flexibility to make creative decisions about its performance venues and its musical selections. This also allows the band to have a shorter season than most other programs. The Marching Season is typically finished by the first week in November which results in minimal overlap with the Pep Band schedule. “Boston University Percussion” is focusing its efforts on becoming a consistent performing presence around Boston and on the BU campus. The ensemble has already become a “fan favorite” at select BU Hockey and Basketball games, where the group has performed to standing ovations and sell-out crowds in and around the Agganis Arena. Notable performances around the Boston area include events such as the New England Patriots’ private 2005 Super Bowl Ring ceremony, performing on “The Wheel of Fortune” during taping in Boston, and performing at Fenway Park before Red Sox games. University Notes: The Marching band is the largest student organization on campus and is the embodiment of "school spirit". This ready-made family offers a unique support system comprised of students representing all schools and colleges within the University and every classification from freshman to graduate. Through participation in the marching band, students learn discipline, responsibility, and social awareness. Additionally, they master skills in time-management, which are paramount for a successful merge between music performance and academics. Music majors, as well as non-music majors attain a wealth of musical knowledge and gain valuable experiences. 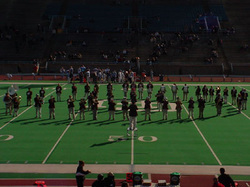 University Notes: Established in 1924, the Brown University Band is one of Brown's oldest and most unique student organizations. Founded by Irving Harris, the band has successfully brought Brown's distinct tradition and music to every student that has walked through the Van Wickle Gates. In addition, the band continues to provide alumni with memories of their days at Brown. With an audience ranging from children to adults, the band manages to capture a smile from all while performing a wide variety of music. From athletic events to commencement ceremonies to the world's only ice skating band, the Brown University Band is the spirit of Brown. 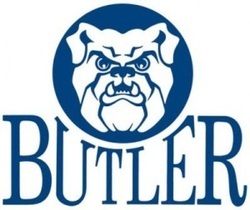 University Notes: The Butler University Marching Band (BUMB), directed by Dr. Matthew J. Smith, is one of the university's most visible ensembles and is truly the "Spirit Center" of the band program and campus. Flags, twirlers, and instrumentalists combine their talents to thrill the audiences at the Butler Bowl and cheer on the Bulldogs. University Notes: The University of California Marching Band is one of the oldest college marching bands on the West Coast with over 100 years of tradition. Over the years, members of the Cal Band have attended over 150 consecutive Cal football games, with the full band at every home game and the Straw Hat Band travelling to games as far as Wisconsin and Hawaii. The current Cal Band, under the baton of Robert Calonico, boasts a membership of over 200 students, and is one of the few bands in the nation and in the Pac-10 Conference that still marches the traditional and demanding high-step form. 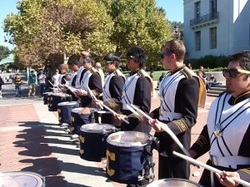 The success of the Cal Band depends upon the loyalty, devotion, and spirit of its members, who, unlike in other bands, do not receive academic credit or financial compensation for their involvement in the Band. Once people see the camaraderie among Cal Band members and the smiles on their faces after a performance, they soon realize that the bandsmen do not work for “nothing.” The California Marching Band performs at all home football games, and at selected away games. The California Straw Hat Band is a subgroup of the marching band which performs throughout the year at various campus and community events, in addition to Cal’s away football games, basketball games, volleyball, and other sporting events. 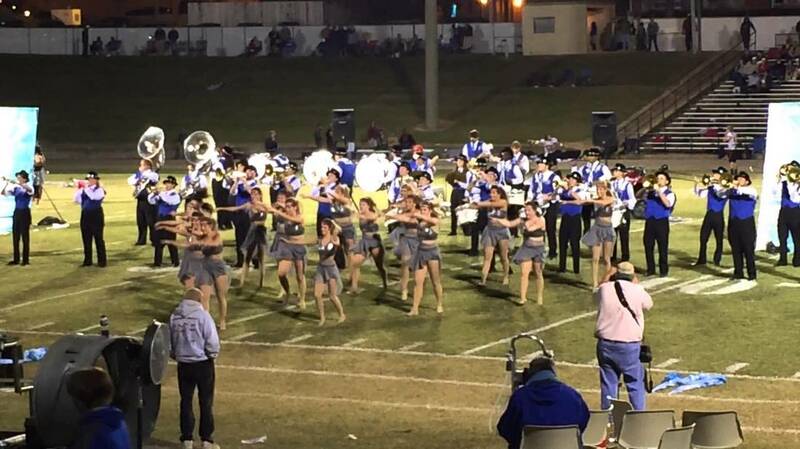 The Cal Band has also been seen on “Wheel of Fortune” and has been given media exposure on numerous occasions through local radio stations, newspapers, and television stations. University Notes: The UCSD Pep band is a student run organization that performs awesome music for various campus and community events. We allow students to continue enjoying their musical experience from various backgrounds. Prior musical experience is not required and you can join us any time of the year by attending any rehearsal or gig. We do not hold any auditions or have any monetary requirements for those who want to join. Our main campus sporting events include basketball, volleyball, waterpolo, soccer, and hockey. Community events include Martin Luther King Jr. Parade, Light the Night, San Diego Pride Parade, and much more. We are also often hired by various campus organizations to provide quality music for their on-campus events. University Notes: The Tiger Marching Band was founded in 1992 by Dr. David McCullough. The fall of 2011 marked the 20th season for the TMB. 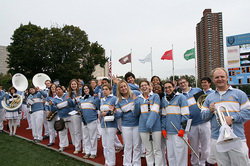 The band has approximately 90 members (both music majors and non-music majors). 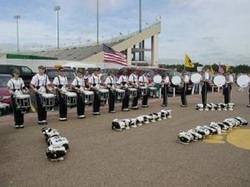 The TMB performs at home football games and exhibitions throughout the state during the fall semester. Check out our calendar to see the dates and times of our performances. University Notes: This outdoor ensemble incorporates the same instruments as any marching band ensemble, including the front ensemble. It incorporates many different styles of music within its repertoire to realize optimal musical and entertainment effects. Participants for this ensemble are full-time Catawba students, regardless of major. University Notes: The UCA Bear Marching Band is comprised of 190+ members, from every major offered on campus. Nicknamed the "BMB", UCA's band travels to one away game per football season, and performs at various High School band exhibitions. The UCA Bear Marching Band also performs at all home football games, and both Men's and Women's basketball games. 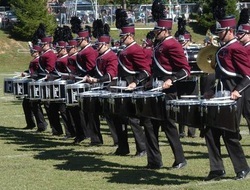 The UCA band also runs an indoor drumline/colorguard known as "Bearly Contained", comprised of the Drumline, Guard, and a rock band assembled from the finest music majors. Originally formed as a recruitment tool, the group has performed for over 4,000 students. Bearly Contained is under the direction of Mr. Brantley Douglas III. University Notes: The "Sound of Central" was formed in 1910 by a group of students and was conducted by students until 1925. The first Central marching band had 25 members and quickly gained popularity by playing at all home and away football games, as well as other college functions. "Anderson's Army," as they were known, was soon considered as one of the finest college bands in the state. 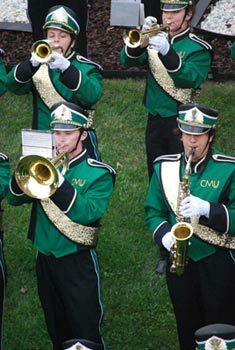 The Central Methodist University marching band has a long history of excellence and tradition. The band has performed for the Kansas City Chiefs and St. Louis Football Cardinals. The CMU Marching Band hosts its annual Band Day competition for high school bands each Fall, which started in 1964 making it one of the state's oldest marching competitions. University Notes:The Chippewa Marching Band is a 250+ member marching band. Special musical arrangements, creative show design, and powerful performances continue to inspire enthusiastic responses from audiences at home and off campus. The band continues to receive high praise for performances at special events, including the Michigan regional contest of Bands of America and nationally televised performances on CBS, ABC, and ESPN. In 2003 the band's membership exceeded 250 for the first time. University Notes: The UCO "Stampede of Sound" Marching Band makes an integral contribution to the exciting atmosphere of NCAA football at the University of Central Oklahoma. With performances at all home games, one away game, and all playoff appearances, the UCO Marching Band provides spirit, excitement for the thousands of fans that see the group perform each season, as well as support and encouragement for the UCO Broncho football team. The UCO "Stampede of Sound" Marching Band is exciting, engaging, and entertaining! University Notes: The Cheyney University band program was re-established in 2005 with the assistance of a very talented, enthusiastic, and determined group of students. In the past three years we have been involved in a wonderful journey. University Notes: The Marching Captains are a high-energy, corps-style marching band that perform at all Christopher Newport home football games, events throughout Hampton Roads, Virginia and around the world. Notable performances include the Philadelphia Thanksgiving Day Parade, the New Years Day Parade in London, a performance of the national anthem at a Washington Nationals baseball game and the St. Patrick's Day Parade in Dublin. At over 200 members, the Marching Captains are one of the largest NCAA Division III marching bands in the country. The band is composed of students from all disciplines around campus, and all CNU students are welcome to join. Auditions for the Marching Captains occur on the first day of band camp, which is held one week before classes begin in the fall semester. Information regarding band camp is distributed during the Setting Sail freshman orientation sessions held in the summer. Visit the CNU Marching Captains Facebook page HERE! University Notes: The UC Marching Band is the most visible of our bands and performs at all home and select away football games as well as any bowl games in which the team may compete. 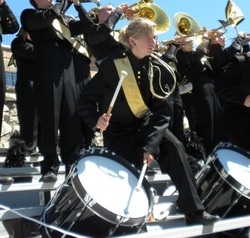 In addition to football games the Marching Band also performs for events such as UC Convocation, marching competitions, and various performances around Cincinnati. University Notes: The Colgate University Pep Band, a completely student run organization, is committed to providing spirit, enthusiasm, and quality musical entertainment at a variety of athletic and community events. For many years, the Pep Band has been an integral and highly visible part of the Colgate experience. Their numerous appearances throughout the academic year at both home and away events help rally support for the maroon and white. Within the Pep Band, there is a tradition of close friendships, memorable experiences, and innumerable (and sometimes unmentionable) adventures. The Pep Band is active throughout the entire year, performing at football, hockey, basketball, volleyball, field hockey, soccer, and lacrosse games. University Notes: The “Golden Buffalo” Marching Band is recognized as one of the premier college marching bands in the United States. Comprised of approximately 200 student musicians from throughout the country, the band remains an integral and exciting part of the tradition and spirit at the University of Colorado. The band utilizes an extremely versatile marching style and consistently performs the latest in contemporary show design. The ensemble has appeared on national television many times and has performed in numerous NFL football games. The “Golden Buffalo” Marching Band has appeared at the Insight.com Bowl, Alamo Bowl, Fiesta Bowl, Aloha Bowl, Holiday Bowl, Cotton Bowl, Blockbuster Bowl, and Orange Bowl. While there is no audition requirement for the Marching Band wind sections, the drumline, colorguard and “Goldrush” danceline are selected by audition only. University Notes: The Maverick Stampede is Colorado Mesa University’s new, high-energy marching band formed in the fall 2012. This fun, positive and exciting opportunity is open to all CMU students who have previous band experience. Due to high interest, demand, and popularity among past and future participants, membership in this ensemble has more than doubled from the 1st to 2nd season to include approximately 120 students, and is proud to be known as CMU’s largest student organization. The Stampede is expected to grow to even larger numbers in future seasons. The Maverick Stampede will perform at all (typically 5) CMU home football games and for a few selected on-campus events (typically 2-3) during the marching band season (mid August to early November). The band will be wearing custom-designed uniforms and performing on new instruments and equipment. University Notes: The Colorado State University Marching Band is a dynamic and growing organization consisting of students from across campus, representing nearly every college. The successful and popular organization has entertained audiences for years with high-powered music and contemporary show designs. The Colorado State University Marching Band’s emergence as a national leader is consistently gaining the attention of regional and national media outlets and organizations, as the group continues to receive accolades for a series of recent innovations and ‘firsts’ for university bands. University Notes: The band is a scramble band, mainly run by student direction. University Notes: The Concord University Marching Band performs at all home football games and select away games and participates in multiple parades throughout the year. The Pride is the featured band at the annual Manassas, VA Christmas Parade and a perennial favorite at the Welch, WV Veteran’s Day Parade. The group performs a wide variety of charts including jazz, rock, pop, and classical. University Notes: The Concordia College Magnificent Marching Hornets Band is open to all students who are admitted to Concordia College Alabama. The marching band is the most visible and fastest growing organization on campus. Now expanding its membership to students who complete audition for membership or scholarship, the Concordia band is recruiting students who want to be a part of an outstanding band program. You do not need to be a music major to qualify for the Concordia College Magnificent Marching Hornet Band or any scholarships pertaining to the band. 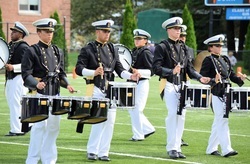 University Notes: The Windjammers is the official drum and bugle corps of The U.S. Coast Guard Academy and dates back to 1957, when the Windjammers was formed as a traditional marching band to provide cadets of the Academy with a meaningful music program. The band started as a traditional military marching band and evolved to a contemporary, bell-front, corps style band and finally to a full-fledged drum and bugle corps. Since their founding, the Windjammers have performed with distinction at special events, festivals and competitions throughout the United States. Some of their most memorable performances include NFL halftime shows for the Redskins, Colts, Eagles, Bills, Giants and Patriots; the Cherry Blossom Festival in our nation's capital, Fall Foliage Festival in North Adams, Massachusetts and the Azalea Festival in Wilmington, North Carolina. Special performances over the years have included the Macy's Thanksgiving Day Parade in New York, several Presidential Inaugurals, Disneyworld and the Shrine Bowl at Molson Stadium in Montreal, Canada. Participating in the Inter-service Band Competition against Navy and Air Force in Colorado Springs was another highlight for the group. University Notes: The Dartmouth College Marching Band is an integral part of many Dartmouth sporting events. In the fall, they open every home football game with a parade through Hanover, concerts at alumni events, a show on the field, the national anthem, and the alma mater. During games, the DCMB keep the crowd lively by playing tunes in the stands, and go on the field again at halftime. After the game, if Dartmouth wins, the band celebrates by marching through the library playing school fight songs. University Notes: The University of Delaware Department of Music has a variety of ensembles and classes available to majors and non-majors. The Delaware State University "Approaching Storm"
University Notes: The Delaware State University Band Better Known As "The Approaching Storm"has quickly become one of the top University Band programs in the nation. The D.S.U Band is known as "The Approaching Storm" because of it's cascade of sound and it's kaleidoscope of movement. It's an exciting, enteraining, highstepping, dancing and prancing unit. The Storm also features the "SWEET 16" (The DSU flag Team) And "D" ELEGANCE (The DSU dancers). University Notes: The Pride of the Delta Marching Band, along with the Delta Belles and the Color Guard, performs for home football games and marching band festivals throughout the state. University Notes: The Drake University Marching Band provides students the opportunity to participate in the flash and fanfare of a high-quality marching program while being involved in the exciting atmosphere that is college football. This one hundred-member, corps style band performs in historic Drake Stadium for all home football games as well a variety of other campus activities throughout the Fall semester. The Marching Band, which is open to all interested students, enjoys campus-wide participation by students from numerous academic majors. Performances by the marching band feature fast-paced, high-energy, pop music including Billy Joel, Carlos Santana, Bill Chase, Stevie Wonder and Gloria Estefan/Miami Sound Machine. University Notes: The Pep Band is composed of members of the Concert Band. The Drexel Pep Band performs at the home games of Drexel Men's and Women's Basketball teams and also travels to post season tournament games. We are an integral part of the Spirit Team which includes the Drexel Cheerleaders and the Dance Team. University Notes: The GSMB is the conduit for school spirit and pride at ENMU. The GSMB—The Sound of the High Plains is proud to celebrate its 77th year of musical excellence! GSMB members are both music majors and non-majors. The GSMB performs to the hottest charts, providing spectacular halftime entertainment for the fans that pack Greyhound Stadium. The GSMB meets during the fall semester. Rehearsals are held on Monday, Wednesday, and Friday from noon to 1:50 p.m. at the GSMB outdoor rehearsal facility. Many members of the GSMB proudly represented ENMU, the State of New Mexico, and the United States of America when they performed, by invitation, in the 2009 St. Patrick’s Day Parade in Dublin, Ireland. The GSMB rehearses in the new home of the Eastern Bands, the Floren Thompson, Jr. Band Hall. University Notes: Emporia State University has many outstanding programs to offer. As a member of one of the most outstanding performance groups on campus, you will be carrying on many ESU traditions of high standards, excellence, and pride. The Emporia Marching Hornets consists of students from virtually every department on campus. With this unique diversity and campus-wide enthusiasm, we can achieve incredible levels of success. The environment at Emporia State University and in the EMH will challenge you to reach beyond your potential. Although your peers can tell you better than I, these experiences can positively impact your life forever. Our common goal is to provide you with an incredibly fun-filled, productive, efficient, and exciting atmosphere. In the EMH, you will be asked to consistently strive for excellence, achieve high standards, while having so much fun you may never recover. It will be your hard work and dedication to the high standards that enable the EMH to maintain successes of the past and achieve new levels of success in the upcoming season. As a member of this organization, your individual efforts will determine what we can achieve as a whole. The EMH have many different types of students participating. Over half of the band majors in some other degree besides music. The EMH is great opportunity to meet people, to continue playing your instrument, develop leadership skills, and be a part of a long standing tradition at Emporia State University. 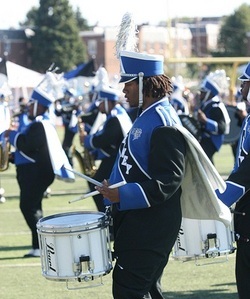 University Notes: The Viking Marching Band has always been a huge part of the Music Department at Elizabeth City State University since it first began. The very first band at ECSU was brought together in 1931 under the presidency of Dr. John H. Bias. The first band director was Mr. James Clark. He was a Biology teacher and a known leader of bands in the Tideqater area. After Mr. Clark's departure from the university, the school was without a band until 1948. In 1948, the band was reorganized by Leon Prather, directing on a part-time basis. In the year of 1959, Ms. Esther Marie Cook of Atlanta, Georgia was named the first full-time band director. From 1960-1965 the band established growth under the leadership of Mr. William H. Ryder. By 1968 the band had grown from 45 members to 100 members. Under Mr. David Williams' leadership, the band soon grew to 126 members. In 1969, the band was asked to perform at its first professional football game. As years have passed, the band has constantly grown. Today, the band program consist of the Marching Vikings, Symphonic Band, and Pep Band.